July 7 & 8, 2018 3rd annual DTLA Salsa Festival FREE! 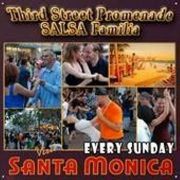 FREE FREE FREE <br> <br> SALSA ON THE 3RD STREET PROMENADE NEARLY EVERY SUNDAY FROM 4PM TO 9PM BETWEEN SANTA MONICA BLVD. & BROADWAY ON THE 3RD STREET PROMENADE IN SANTA MONICA, CA. <br>ALL LEVELS OF DANCERS ARE INVITED. COME ALONE, BRING THE FAMILY OR A DATE. ARRIVE EARLY! This is the start of our 16th year on the 3rd Street Promenade. We have over 10,000 members from our Salsa Meetup Groups, FaceBook page and many visitors from the general salsa community who join us every Sunday for the fun, beauty and the excitement of dancing on the street! Our Meetup is a casual and loosely structured group. We model ourselves after the street salsa gatherings you would find in places like Cuba, Puerto Rico and New York. Not only do we have Salseras and Salseros but entire families, friends and others who are interested in music, dance and photography that gather to listen, spectate and talk. In addition to Salsa there are Tango and Swing Dance Clubs on the 3rd Street Promenade. Please feel invited to visit and dance with them. The 3rd Street Promenade and nearby Santa Monica Place has restaurants, theaters and street entertainment. UPDATE: The free beginner salsa class was replaced by various "festivals" and "Bootcamps" we will have during the first two (2) hours of our Meetup on select Sundays when volunteers make themselves available. SPECIAL NOTE: SALSA FAMILIA NOW MEETS BETWEEN WILSHIRE BLVD. AND ARIZONA NEAR CABO CANTINA.